Powerlong Group, the Shanghai-based diversified-business giant, has high-profile real estate, hospitality and tourism, culture and arts, and commercial divisions. But it’s the group’s lesser known interest in information technology, particularly as it relates to unmanned retail environments, that is the focus at Ideas Lab, a new multifunctional space where consumers, researchers, developers, and other stakeholders in digitally informed commerce can interact and, it’s hoped, learn from one another. To realize this vision, turned to , a studio with loads of cutting-edge cred. As expected, firm founder and design director Li Xiang created a sleek contemporary incubator for innovative thinking about offline retail’s information-driven future—but did so, paradoxically, by reaching back to a design vocabulary from the past. Located in the city’s central Minhang district, the two-story lab occupies 11,800 square feet in a former factory building, of which there are many in the now primarily residential enclave. Li focused on the neighborhood’s industrial legacy when looking for inspiration, thinking about the physical and economic aspects of manufacturing as ways out of the Matrix-style imagery that has come to be the default aesthetic for many IT-related projects. Inside the overhead capsule is co-working space for the R&D staff. Photography by Shao Feng. Working with this perception, Li adopted the classic industrial factory, found everywhere in the developed world from Akron, Ohio, to Guangzhou, China, as a prototype for the project, but “removed the complex parts and kept only the most basic, functional elements,” she reports. This resulted in three iconic manufacturing-plant features—massive reaction tanks, convoluted energy delivery pipes, and elevated catwalks and platforms, all in stripped-down versions—being used as the governing forms behind the layout and look of the facility. A wrought-iron spiral staircase links the ground level to the observation platforms. Photography by Shao Feng. Li’s first move was to demolish the floor slab in the public, storefront section of the L-shape plan, creating a 30-foot-high volume. Into this space she inserted an elaborate system of tanks, pipes, and catwalks—all streamlined and spotless—so that it now resembles a cyber-age edition of a 19th-century industrial turbine hall. The simplified forms and limited palette—mostly white and gray, with splashes of black and blush pink—give the interior a comic-strip boldness. There are Victorian-Gothic flourishes, too, like the delicate wrought iron used for a spiral staircase and catwalk balustrades, that add a playful, Jules Verne tone, with its delight in the magic of science, technology, and machinery design. Along with this make-believe quality, each industrial element in the plant has acquired a new function. 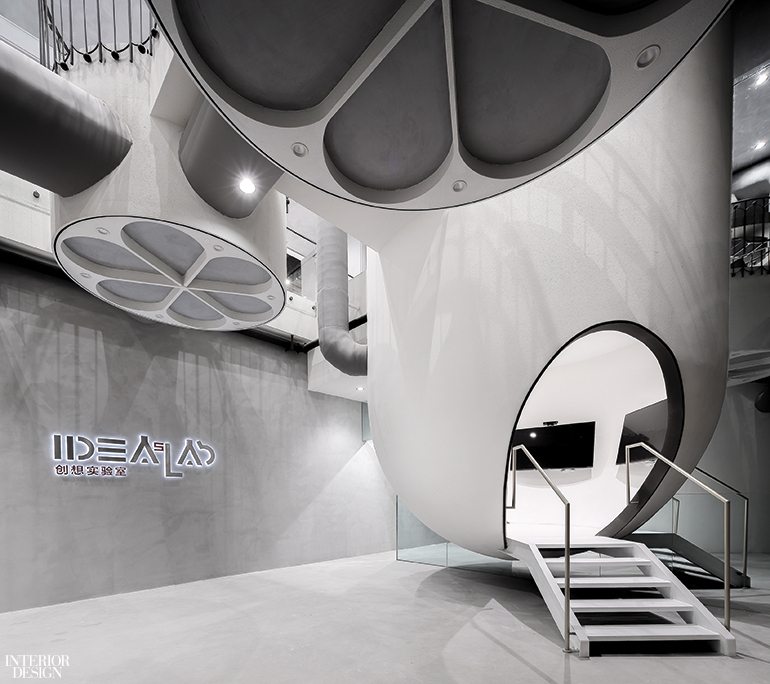 Reaction tanks become what Li calls “experience buckets,” five oversize, vertically standing capsules that rise from the ground floor, pass through a network of catwalks on the second level, and connect with the ceiling 15 feet above. 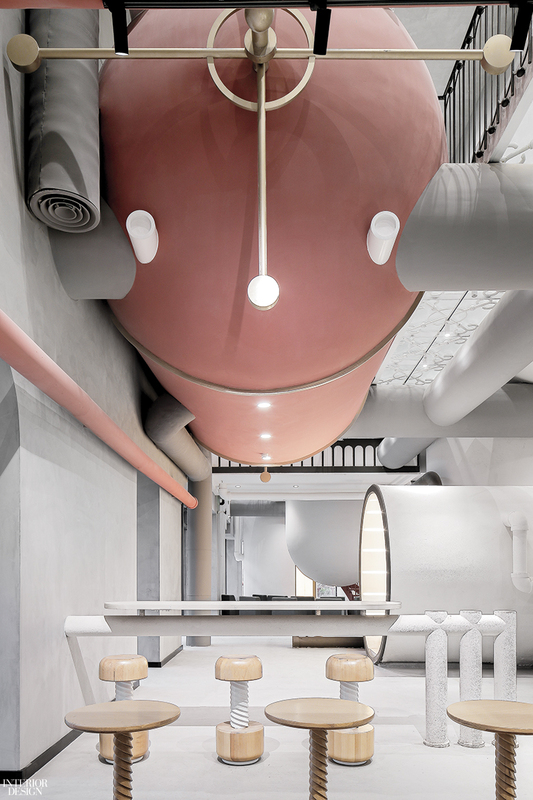 A sixth capsule, painted pink, is oriented horizontally overhead, so it appears to float like a zeppelin; it provides co-working space for the research and development staff. A fiberglass-reinforced gypsum “experience bucket”—one of six—is outfitted with flat-screen monitors for consumer presentations. Photography by Shao Feng. 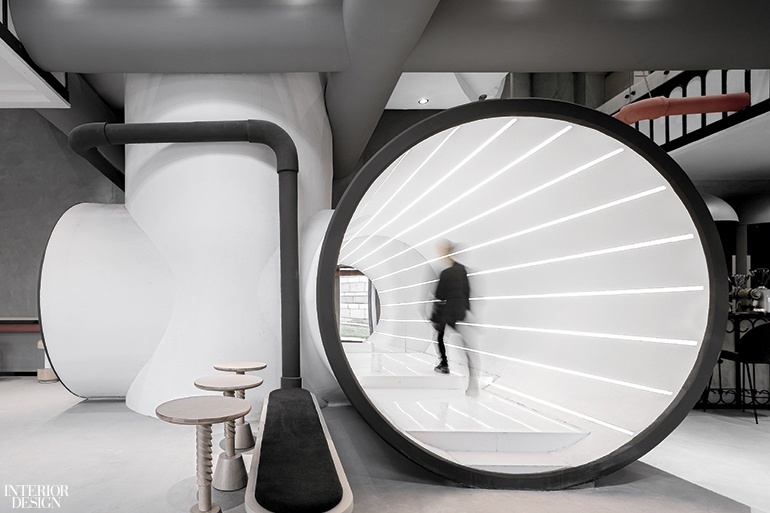 Fitted with flat-screen monitors inside, the reaction tanks comprise the interactive heart of the lab, where the public is presented with different unmanned retail environments—a café, a flower shop, and a fitting room, among them. “The assigned task was clear,” Li states, “to design places for consumers to experience the future mode of offline retail,” one in which assistance is provided via such self-service technologies as touch screen, voice command, and robotics. Powerlong’s R&D staff can monitor some of these interactions from the catwalks above. 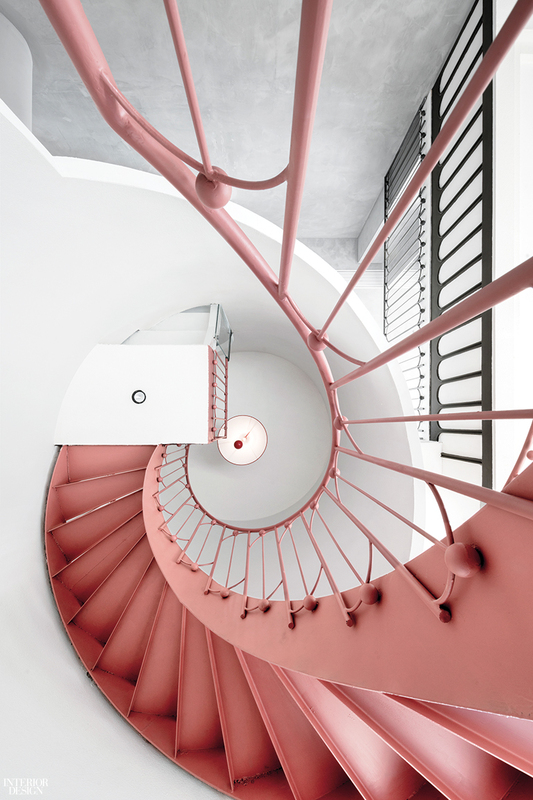 The wrought-iron spiral staircase—the most visible connection between the lab floor and the catwalks because it, too, is pink—anchors one end of the main space. An enormous, open-ended pipe, lying on its side, dominates the center of the lab. Made of fiberglass-reinforced gypsum (as are all the buckets and much of the surrounding ductwork), and internally lit with LED strips, the cylinder serves as a corridor to consumer restrooms. Next to the pipe, consumers can enjoy their self-served lattes and cappuccinos while seated at wooden café tables with turned bases resembling screw valves. Occupying the other end of the lab, the largest experience bucket is accessed via an open tread stair. ONLINE EXCLUSIVE: The lab is housed in a former factory that was given new windows with painted stainless-steel frames. Photography by Shao Feng. Unlike their steam-carrying industrial forebears, the gray, pink, and white pipes that snake around the lab contain high-tech cabling and HVAC systems. Powerlong’s employees, who number around 150, are also spared the Dickensian conditions that typically prevailed in 19th-century factories. 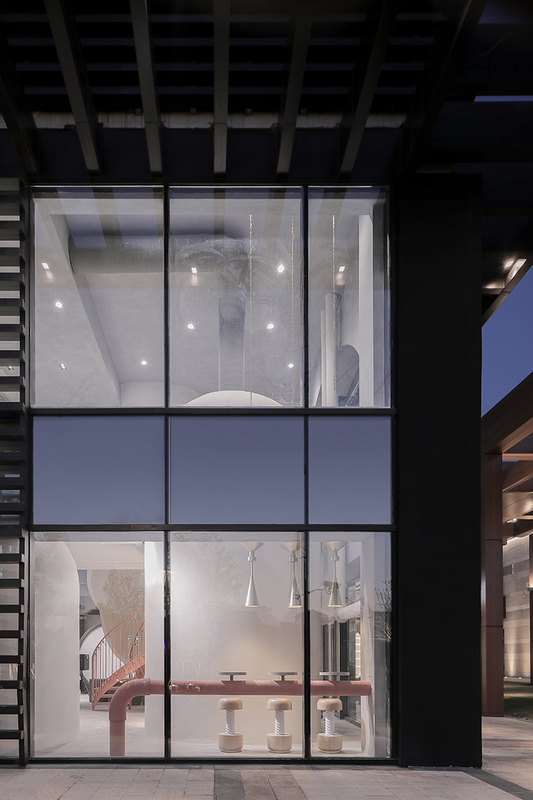 They work in a bright, open-plan wing on the second level, where a quartet of additional capsules house restrooms. When they want to check out the efficacy of their concepts with real people, they need only step onto one of Li’s adjacent catwalks and watch the engaged consumers below. Product Sources: XiangCasa: Custom Stools, Custom Tables.